We believe unnecessary complexities are ugly and get in the way of pursuing meaning. 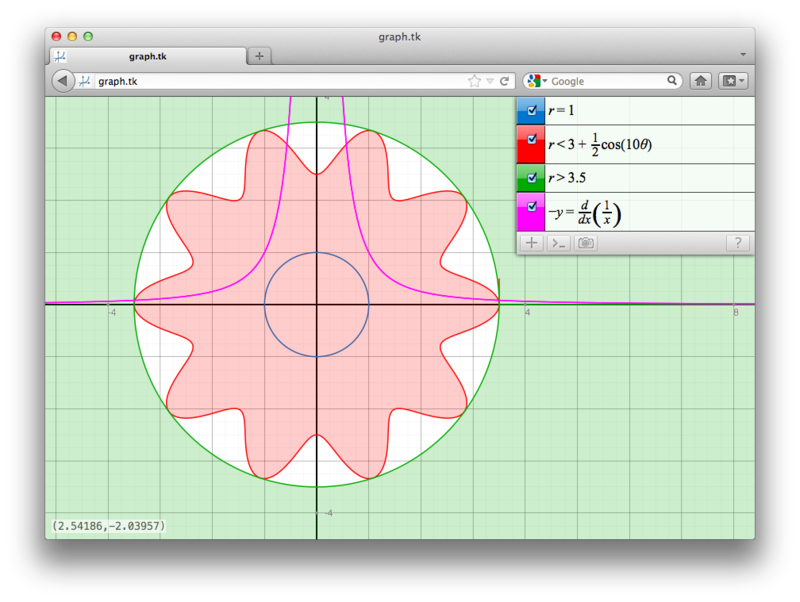 Through its intuitive interface, Graph.tk allows pure interaction with math in a way that has never been done before. Graph.tk is easy and fast to use. Type the equation using * for multiplication, / for division and ^ for exponentiation. To type special characters use "\name". For example, "\sqrt" yields √ and \pi produces a π. 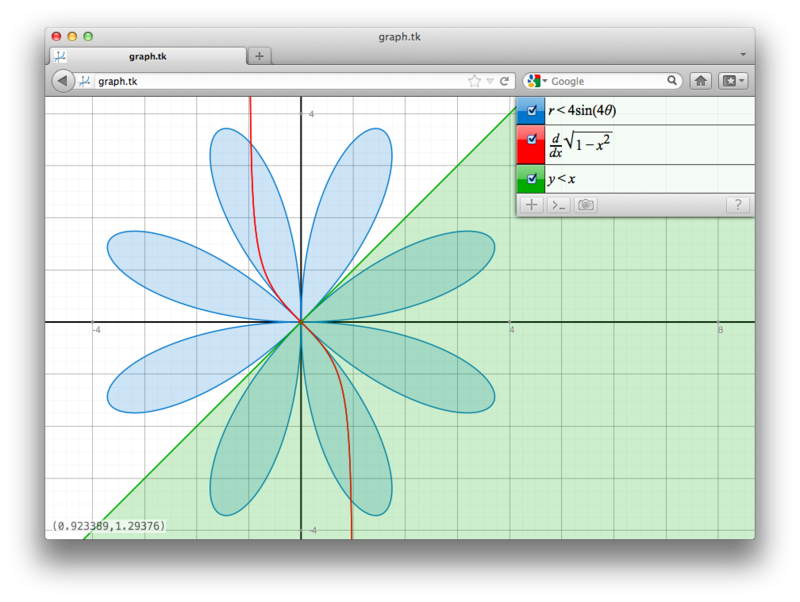 This is what gives graph.tk the power to find derivatives, integrals, inverse functions, and solutions quickly and reliably. Runs straight from within the browser using the new HTML5 features. But it can still save all the graphs, and it still works when you're not even connected to the net! You will just need to have a good modern browser (Firefox 4+, Google Chrome 14+, Internet Explorer 9+, Opera 11.60+, Safari 5+). 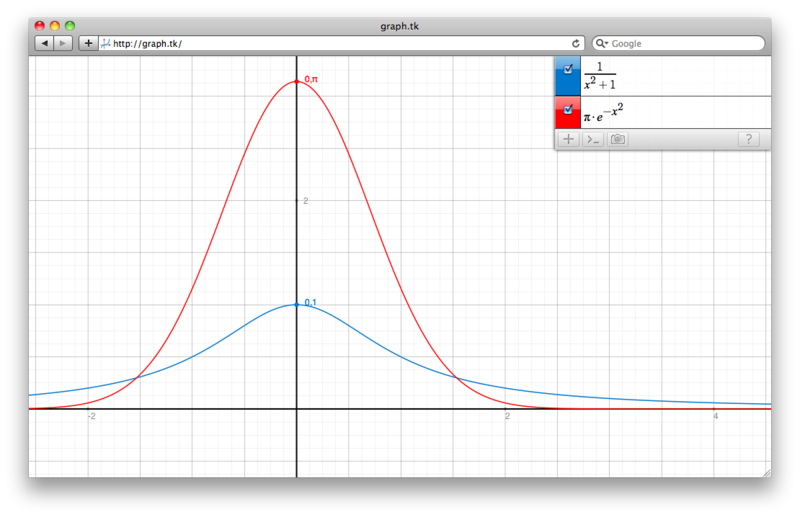 The graph on the left was generated using the graph.tk API. Let us know what's wrong. There are many bugs and usability flaws and we need to know about all of them. Your feedback is well appreciated. Graph.tk is free software and comes with absolutely no warranty.